Germany, one of my favorite countries, and a country that has produced a plethora of fantastic Metal bands over the past 3 decades, therefore I'm generally excited to hear a new band hailing from Germany, because usually I'm not disappointed, and luckily, that is once again the case. 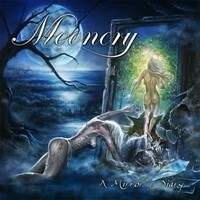 This is the third full length release from Germany's MOONCRY and from the first notes it's obvious that the band sticks to the German tradition of creating excellent Metal music, while described as Heavy Metal, the band first shows its edge with the opening track "Burning Curtains", demonstrating a far harder edge than most Heavy Metal bands and including harsher vocals from singer Sali Hasan (who does an excellent job on this release, as do the rest of the band, excellent musicianship throughout). "Defamed Pride" starts out slowly and grows into a slow pace but very infectious riff, later demonstrating this albums strength, the pace changes, The band doesn't stick to just one specific rhythm per song, songs slow down and speed up making it very interesting and unpredictable. "Scylla" is fascinating with a middle eastern opening and heavy riff making it both heavy and very melodic, “Reflection of Lies” is no less interesting with is very slow almost spoken word opening while building up into a heavy and grandiose song. Bottom line is that this is one of the best examples of interesting Heavy Metal I've heard in a while, a fascinating and never boring album played and written expertly.